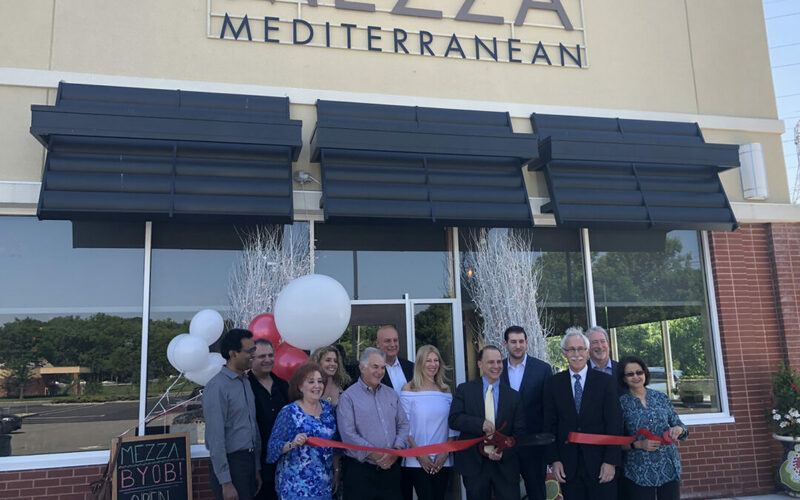 LIVINGSTON, N.J., June 4, 2018 – Mezza Mediterranean recently hosted a ribbon-cutting to celebrate its official opening at The Shoppes at the Livingston Circle at 277 Eisenhower Parkway in Livingston. This marks the first expansion for the popular restaurant, which also has a location in Westwood, N.J.
Mezza Livingston occupies approximately 3,000 square feet at the 93,000-square-foot shopping center, which is managed and developed by Eastman Companies. Jennifer Corrao and John Negri of Weichert Commercial Brokerage represented the tenant and Florian Suserman of Ripco NJ, exclusive leasing agent for the property, represented the landlord. The space received a head-to-toe makeover that included a new top of the line kitchen, imported Spanish floor tiles, Moroccan decor and sleek, modern furnishings to create a spacious, casual ambiance where customers can enjoy a good meal and relax with family, friends or business associates. The menu features the restaurant’s signature cuisine – “authentic Mediterranean with a modern touch” – with an emphasis on sourcing the freshest possible ingredients available year round. Price points are similar to those in Westwood, and Leone noted the owners’ desire to “make people happy” by replicating the customer experience in terms of food quality, artistic presentation and attentive service. Situated in one of the region’s busiest retail corridors, The Shoppes at the Livingston Circle serves a growing residential population of more than 158,000 people within a five-mile radius. The center’s diverse tenant lineup offers a combination of national and local retail brands including Hand & Stone Massage and Facial Spa, Ike’s Bagel Café, Olive Garden, Choice Pet Supply, Wine Legend, M&T Bank and Zen Japanese Restaurant. In addition to Mezza Mediterranean, The Shoppes’ newest tenants include Club Pilates, Goldfish Swim School and CycleBar. Aldi, the fast-growing supermarket chain, will open late summer or early fall in the space formerly occupied by The Fresh Market, and Fitness 1440 and Moxi Blowdry & Beauty are coming soon. Recognized leaders in high-quality real estate developments, Eastman Companies and its affiliated companies are celebrating 40 years of owning, managing and developing properties throughout Northern New Jersey. Headquartered in Livingston, N.J., the full-service firm’s portfolio totals more than 2 million square feet of office, retail and industrial space in Essex, Morris, Bergen and Burlington counties.